Make a tasty squash pie featuring a saucy meat filling! 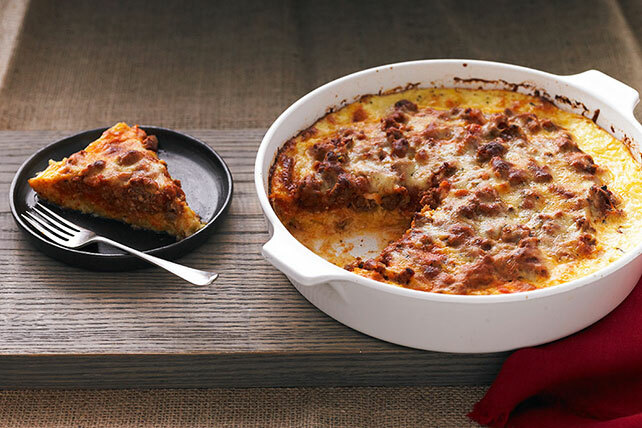 The crust of Spaghetti Squash Pie is made with spaghetti squash, butter, eggs, Parmesan and garlic. Pierce squash with fork several times. Microwave on HIGH 15 min. or until tender when pierced with knife. Meanwhile, brown meat in large skillet; drain. Return to skillet. Stir in pasta sauce and 1/2 tsp. seasoning; bring to boil. Simmer on medium-low heat 5 to 8 min. or until slightly thickened. Cut squash in half; remove seeds. Scrape squash into large bowl. Add flour; toss to coat. Add butter, eggs, Parmesan and garlic; mix lightly. Spoon into 10-inch pie plate sprayed with cooking spray; top with meat sauce, leaving 1/2-inch rim around edge. Top with shredded cheese and remaining seasoning. Bake 30 to 35 min. or until squash mixture is heated through and cheese is lightly browned. Substitute KRAFT Shredded Mozzarella Cheese for the Italian blend cheese.